Sometimes the simplest recipes can taste so amazingly delicious, and this salad is one of those recipes. 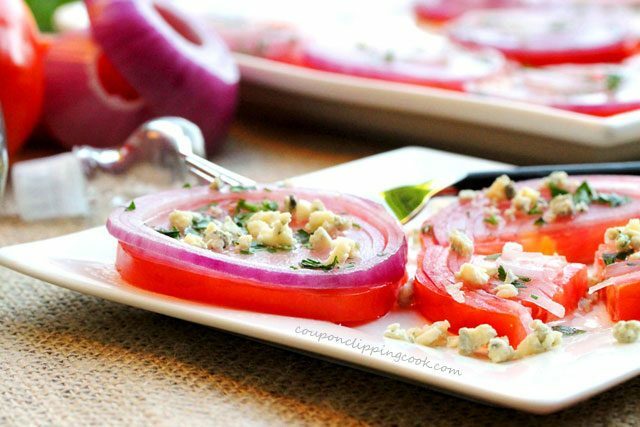 It’s quick and easy to make, full of flavor and looks so pretty and colorful when served. 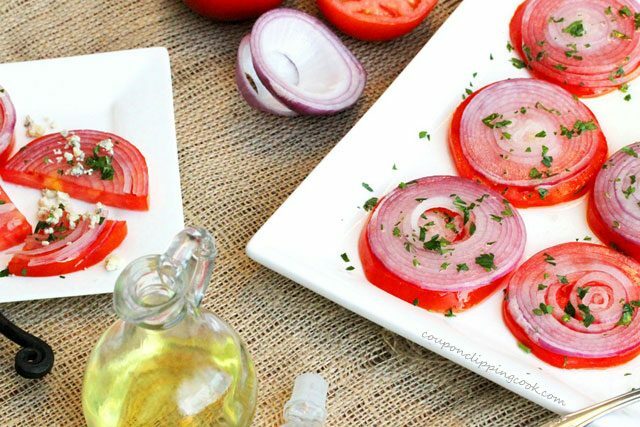 Thickly sliced vine ripened tomatoes, thinly sliced onion and olive oil are the main ingredients for this salad. Then fresh parsley and crumbled blue cheese are added for more layers for delicious flavor. And the toppings can be changed up to your liking. Instead of parsley and blue cheese, fresh basil and crumbled feta would taste really good too. 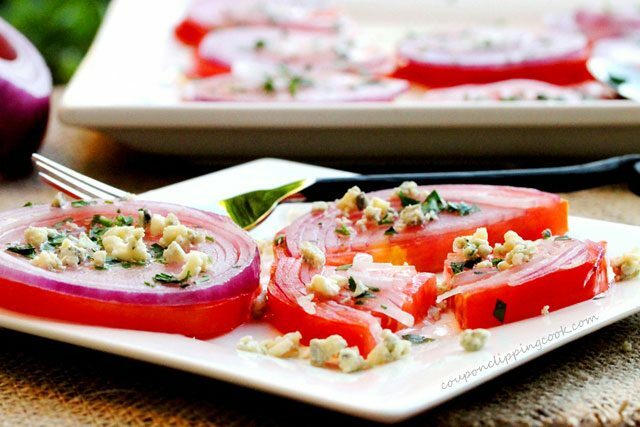 This salad makes a nice appetizer or side dish that’s perfect when vine ripened tomatoes are available at the market. 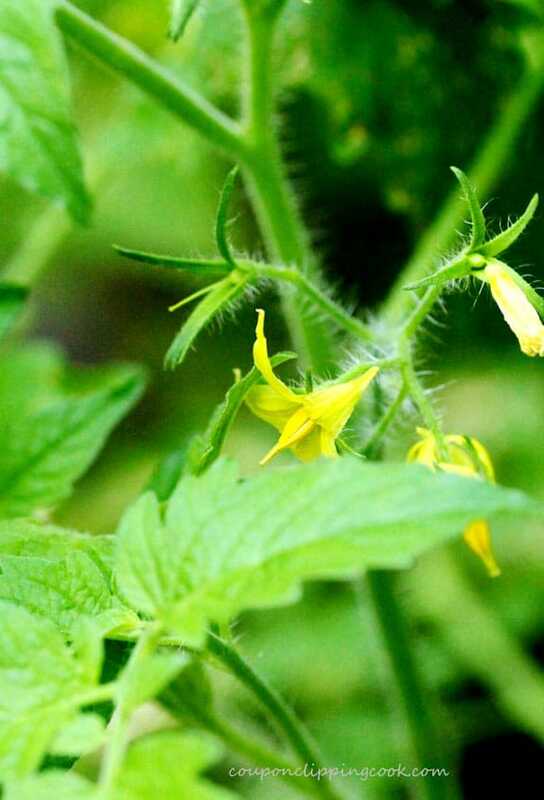 If you grow your own tomatoes, even better. Each year when the weather gets warm I plant tomatoes and some years yield more tomatoes than others. 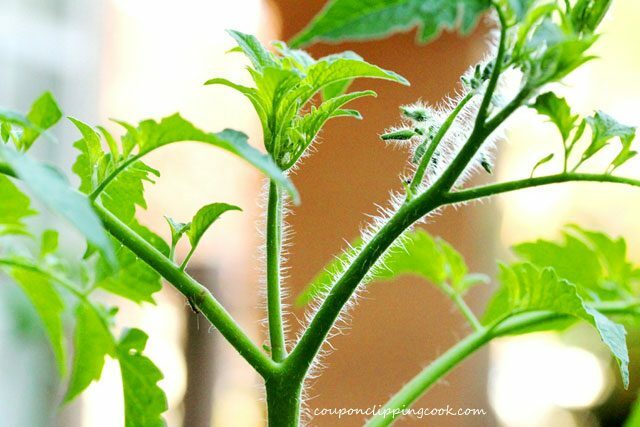 In this tomato plant from my vegetable garden there’s a small critter hanging out. Do you see it? 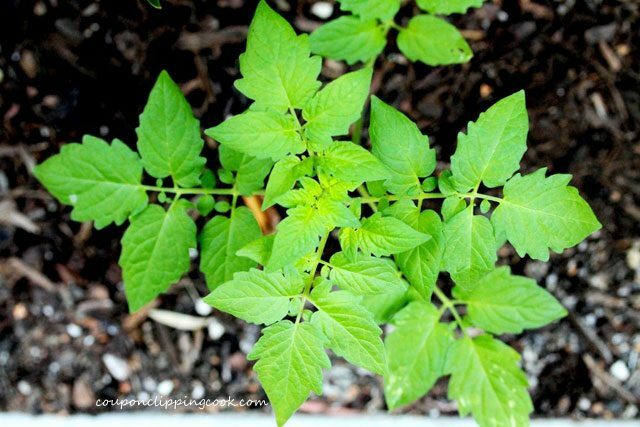 If a tomato from one of my tomato plants gets a little too ripe or if a critter has dined on it, I’ll bury the tomato in mulch nearby and sometimes another tomato plant will grow from it in the future. The tomato plant in the picture above grew from a tomato that I previously buried. Since I change up the type of tomatoes I plant each year, it’s nice when the tomatoes grow this way because it’s a surprise what type of tomato they’ll turn out to be. 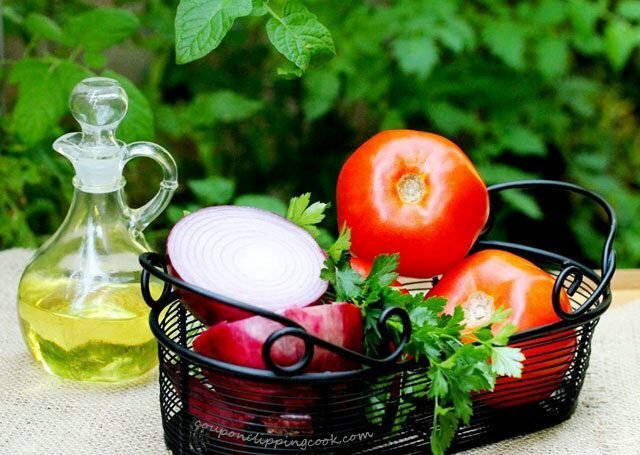 Let’s check out the ingredients for this tomato and onion salad. 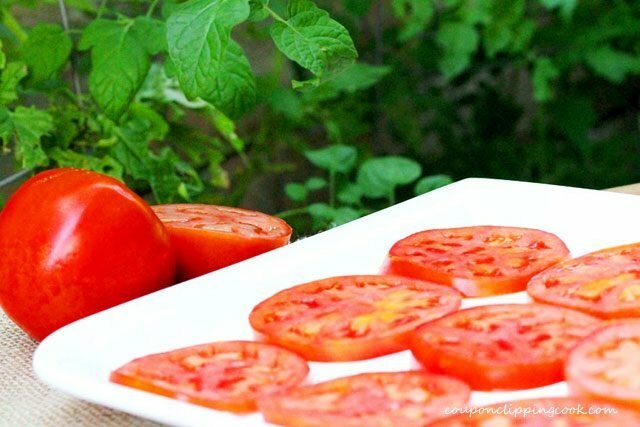 Slice the tomatoes into fairly thick slices (about ½ inch wide slices). 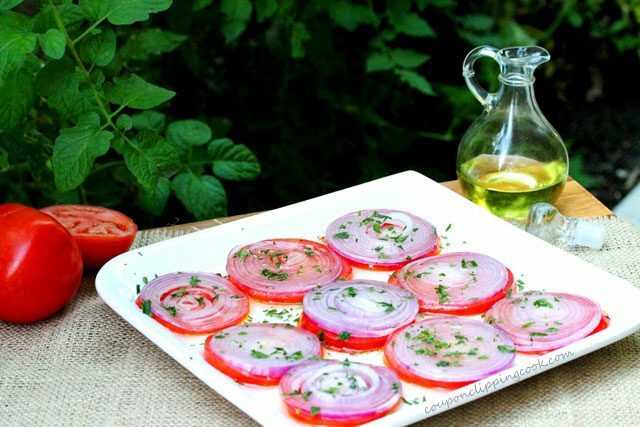 Lay the tomato slices on a large flat serving plate or platter. 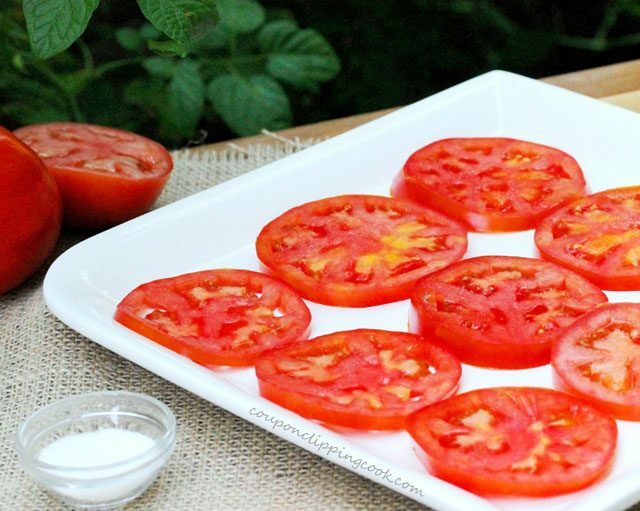 Sprinkle a little salt on top of each tomato slice. 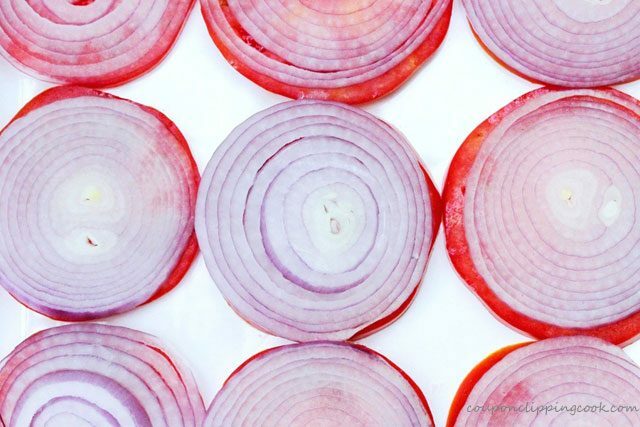 For each slice of tomato, cut one very thin slice of red onion. 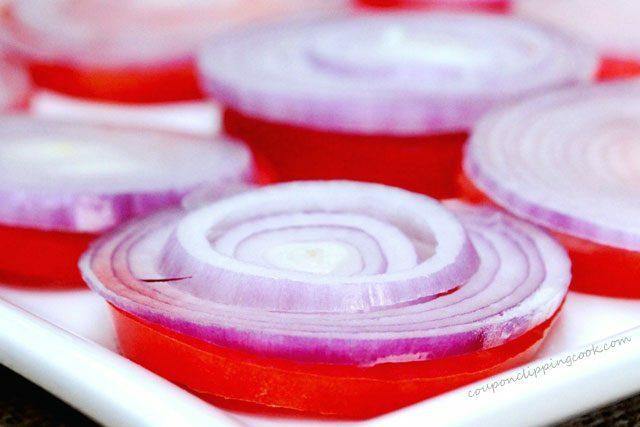 Lay a slice of red onion over each slice of tomato. 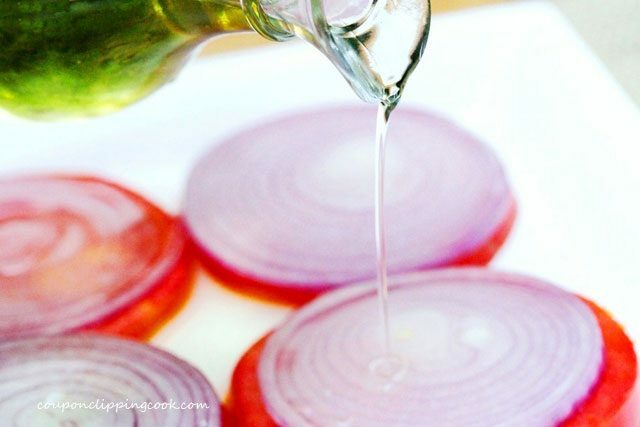 Next, generously drizzle olive oil on top of each slice of onion so that the tomato is covered in the olive oil as well. Depending on the size of your plate, you may need more olive oil. 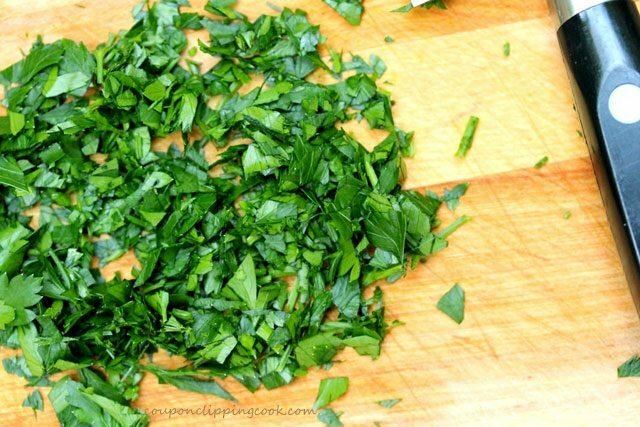 Chop the parsley (or fresh basil if preferred). 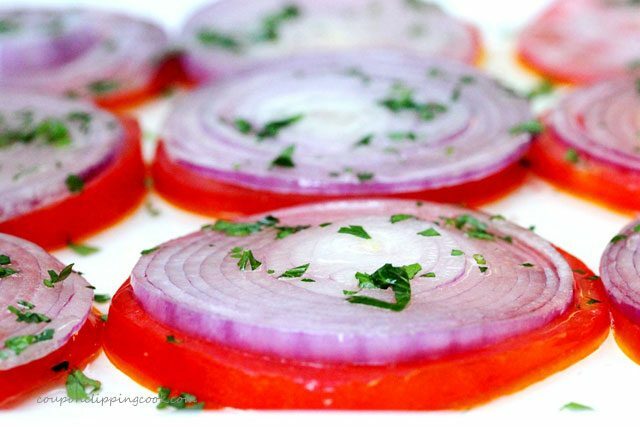 Sprinkle parsley on top of the slices of onion. …let sit in the refrigerator for an hour before serving. 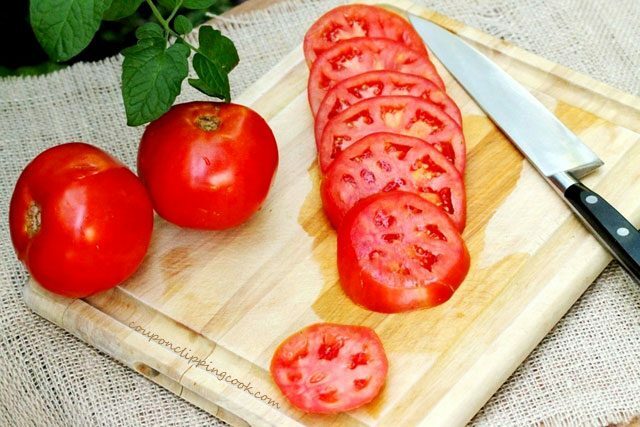 Slice the tomatoes into fairly thick slices (about ½ inch wide slices). 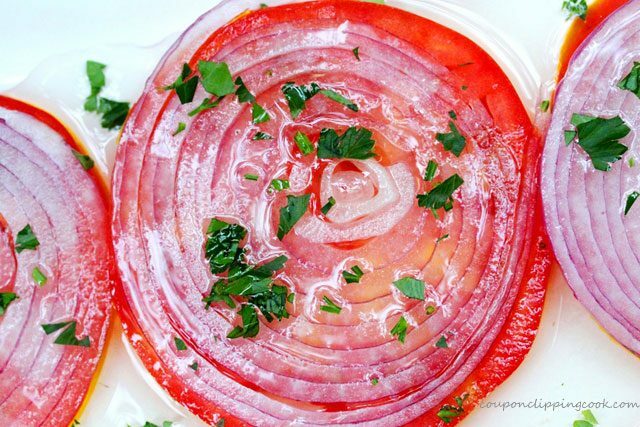 Lay the tomato slices on a large flat serving plate or platter. 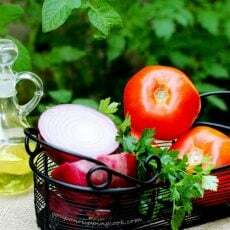 Sprinkle a little salt on each slice of tomato. 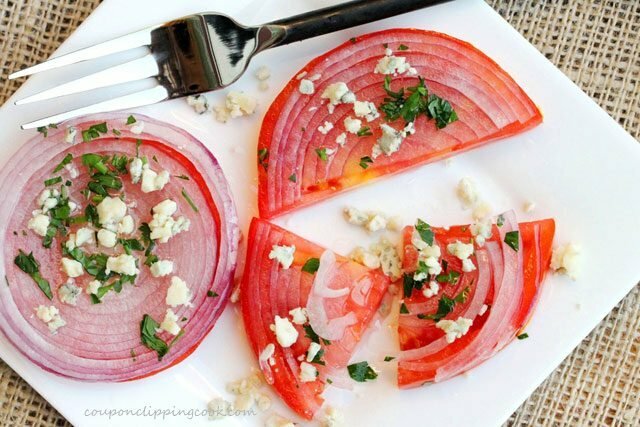 For each tomato slice, cut one very thin slice of red onion. 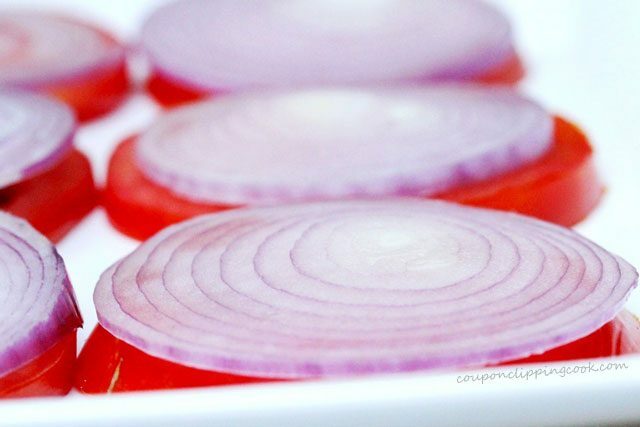 Lay a slice of red onion over each slice of tomato. 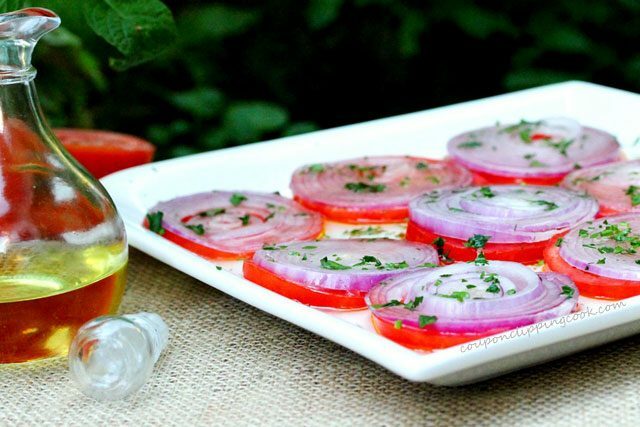 Generously drizzle olive oil over the top of each slice of onion so that the tomato is covered in the olive oil as well. Depending on the size of your plate, you may need more olive oil. 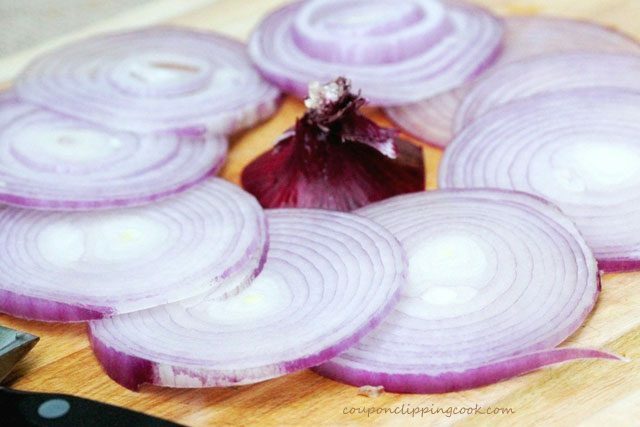 Sprinkle parsley on top of each slice of onion. Cover with plastic wrap and let sit in the refrigerator for an hour before serving. Just before serving, top with crumbled blue cheese. Thanks so much for adding me on foodbuzz. I’m so glad I checked out your blog. This is an awesome site. The layout is super cool and efficient. 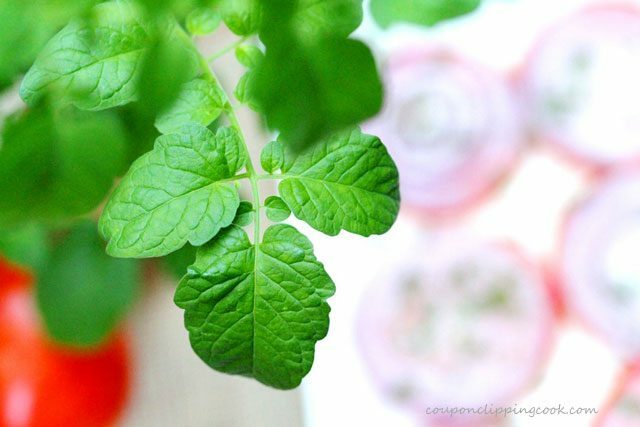 Your photos are lovely and your recipes are so simple. I’m going to try this tomatoe one soon. Maybe I’ll add mozzarella for a caprese-inspired salad. Keep up the good work. Hi! Thank you very much for visiting! All the pics look so bright and gorgeous, and summery!! I hope your tomatoes keep producing for a long time!! Hi Natalie, thank you for stopping by! Hi Jessica, so glad you liked it. Nice to meet you and thank you for the following! I love this presentation GORGEOUS. The flavors are right on too. Love this recipe!